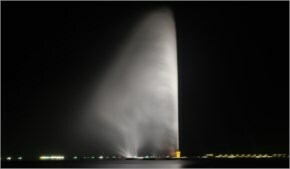 King Fahd's Fountain, also known as the Jeddah Fountain, is considered an important landmark of Jeddah, as it is the tallest of its type of fountain in the world, the length of it exceeded the length of Eiffel tower when it was built. the fountain is located on a small island connected to Assalam Palace peninsula on the coast of Jeddah, on the west coast of the Kingdom of Saudi Arabia, it was donated to the city of Jeddah by King Fahd, hence its name. 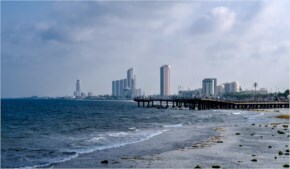 It was constructed between 1980 and 1983 to be like Geneva fountain, but it didn’t please the planners. It and was launched in 1985 after applying the modification to have it in the final form pumping sea water with 124 miles per hour speed. The base of the fountain looks like a censer as a signal for Arabic magnanimity. and it uses saltwater taken from the Red Sea instead of freshwater. The water passes several filters to remove the dirt and sand from it before ejecting. It uses over 500 spotlights to illuminate the fountain at night.